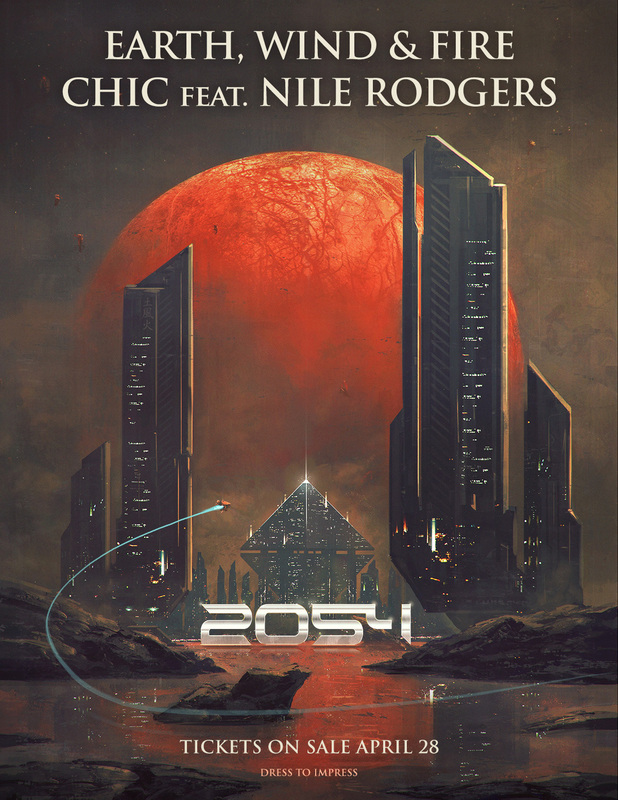 Two of the most successful and critically-acclaimed bands Earth, Wind & Fire and CHIC ft. Nile Rodgers present 2054 – The Tour, which will travel across 20+ North American cities this summer beginning July 12 in Oakland, CA. The tour, promoted by Live Nation, will take the multi-platinum selling groups through major U.S. cities including New York City, Chicago, Philadelphia, Atlanta, Boston and Washington, DC before concluding August 22 in Detroit, MI. Amping up the summer fun, 2054 The Tour will feature a special guest DJ and a specialized seating configuration toward the front of the stage where seats will have additional space between them to encourage audiences to dance the night away. Tickets on sale April 28! Please come to Canada! Loved your show in Ottawa . Will there be any meet and greet for the San Antonio, Tx concert? What is included in VIP tickets and the price? Where and when can i purchase tickets for the Washington Dc tour. I am a big fan of earfhwindandfire and have been for years. would love to see you all in person. I see you’re appearing in Clawson, Mi. Aug 22,2017, But my family will be in Buckhead Ga. for a Family Reunion. One Day Hopefully I will get “too” see your performance. Thank you Brenda Washington. When will you be coming back to the uk? I hope that Eart Wind and Fire a come back to Omsha Ne !! I am s big fan and I seen all thrust show in Omaha Ne!!!! The show in San Antonio last night was phenomenal! The performances were incredible! We thoroughly enjoyed this opportunity to experience the soundtracks that have accompanied our life journey! A 9 year old with us.for her first concert will measure all the concerts in her lifetime by the standard set by this show. Most of my life, Ive waited too long to witness the greatness that is The Elements EWF in person. When the announcement was made that the tour would be coming to my city, San Antonio Texas, I made every effort to make this concert with my young children who danced the entire concert. It would be something we shared that would be engraved in our hearts, souls, and minds for all eternity. Thank you for touching so many lives including our own. Life would truly be difficult without The Elements of Earth, Wind, and Fire. Our lives depend on them. Peace and blessings to you and your families. EWF played the “X” in St. Paul, MN July 27, 2017 and rocked out the house. You continue to bring such JOY TO MY SOUL !! Thank you gentlemen for keeping the spirit alive! God speed Reese!! Are you coming to Vancouver, B.C. I regret that this night it Will be not possible to hear and see you at the concert!!! Because of bad weather I saw you in 2016 in Rome and 2014 !! Pls send me your news and if it s possible to see you in Italy ! My husband & I saw them in Johnstown Pa in March 2018!!! We had front row seats & I did NOT sit the entire show!!!! Absolutely LOVED LOVED it!!! !